Showing results for tags 'saloon'. Hi All, Before I go ahead and buy one.... thought I'd ask the question first. I have just fitted my GRP wings and noticed the Front Valance has had a small knock (Dented Corner) Looks like someone has tried to straighten but doesn't line up with wings. I would like to replace the whole panel but what is it like fitting a Lower front Valance? Could I use a bolt on technique or would it need to be spot welded? any info greatly needed and with thanks. or i will go insane! Starting a fresh thread for my Polo Saloon 1997! Thought it was best as I first debuted it on the introductions thread page I have owned it since October, and have sadly not really had much time (or money mainly) to do anything to it. It's been an awesome daily, and is fun to drive. It really does need work though. I'm going to attach some pictures of it, and update this thread whenever I do anything to it, hopefully you guys will enjoy! Regarding the plans for it, the first thing that needs doing is it's clutch, then sort out it's perishables, then get me some nicer wheels! Hello everyone I'm new to the forum, and I've recently bought my first VW (finally!) It's a 1997 Polo Saloon 1.6 L, which I believe to be a 6nk2? An old lady in my area traded it in for a newer model, so I snapped it up as it's been looked after well for the past 20 years! I've never modified my previous cars due to them being a Yaris and a Micra but I've got plans for it already! I'll post progress pictures? See you around! Here goes! As of August 2016 I became the new keeper of this old girl. I'd been looking for one for around 4 months before this 1.05L popped up for sale. A friend and I made a 3 hour trip across the country to go and see it with the intention of buying it no matter what. So I did... even though first impressions were that it needs a lot of work! I'd wanted a new project to get stuck into anyway so it didn't put me off. The odd patch of rust here and there, grille smashed from someone reversing into it, dents here and there. Just generally needs a lot of love thrown its way. First mod, lose the window stickers. Being a fan of the smooth flowing JDM 70's and 80's cars, I pulled all the door bumper strips off, which make the car look untidy. Also removed the bumpers to see what it looked like. Also to gauge if there was any more rust I hadn't seen. I then went a step further and pulled all the rivets out of the arch trims and removed all of that too, again to see if there was any rust hiding on the arch lips. I definitely got away lucky as all the arches came up really nice. Its just a shame about the two front wings as the passenger side has a very bad repair from a previous dented which looks like it was kind of pulled straight and painted over with a rattle can and theres clear coat overspray all over the place. The drivers side has a crease right on the swage line where it meets the arch, drivers looks repairable, but a replacement passenger was ordered. Hello All, New to the forum & not sure where the best place to put this was so Mods please feel free to move. Looking for help/tips/buying guide for a mk2 polo Derby 1989. From the pictures it looks in fairly good shape, few dings around the body work & carb needs some work but interior is sweet & no other major issues that I can see. 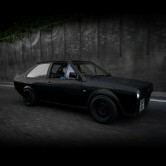 Hi all, Does anybody know of a supplier who still stocks a window seal for my Mk2 Saloon? Started the strip down to paint and noticed water in the boot.... turns out the rear window has been siliconed up the top O/S Corner. Obviously not correct... So before I take the window out I want a new seal in my hand in case this one is dead. Now I have called Heritage, No luck.... Searched the Net, No Luck..... I had thought about a Universal Window Seal- if anybody has a advise on this I'd be very grateful Just looking for advise :) Many thanks! Hi All, I have seen a few pictures online of derbys with a teardrop shaped trim, not a full wheelarch trim. I dont want to get the whole arch smothed down as its too expensive. Where can I obtain this? Thanks in advance! Hi all, One of my rear shocks is now leaking and need to get something to replace them. I have heard that mk1 golf coilovers fit the rear of a polo classic (saloon), is this true? I don't have a great deal to spend on them, but I'm only after the rear coilovers if that's possible. I've seen some technix's which someone is selling brand new for £80, and was wondering if they're alright? Is there any coilovers anyone would recommend? I would only be replacing the rears since the fronts are good. Any help would be great! Thanks in advance. i just got hold of this MK2 'loon its a Classic GL 1.3 4spd 45k genuine miles Stratos Blue all original except the steels. Registered: 1.8.84 The previous owner believes this to be one of the first polo classics in the UK after they changed the name from the derby, and that this one may have been a dealer's demo car with a high trim level. It has chrome trim along the front and rear window seals, along both bumpers, along the grill and around the dash clocks. it also has a chrome strip down the side which he stated he had never seen on a 'loon before. it also has factory parcel shelf speakers and a sunroof. Are there any 'loon enthusiasts that know more about trim levels and when they were released etc. ?